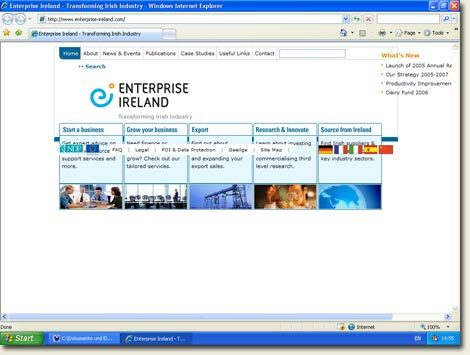 Just to let you know that our IT Department have been working on browser incompatibility and the site is now compatible with IE 6 & 7, Netscape 8, Firefox 1.5 and Opera 9. My guess is that the developers (whoever they are) work in Internet Explorer (I was going to write IE but thought it might confuse issues with EI!). For a site as important as EI’s this is a true blunder – you have to maximise the compatibility across as many platforms as possible. 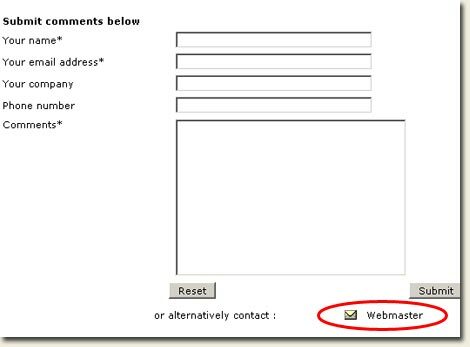 I have highlighted the mailto link for the webmaster (again not easy to discern that you are looking at a link). 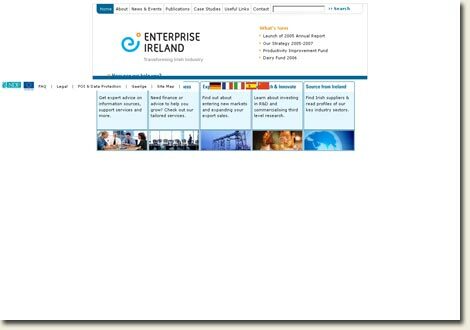 As the baton carrier for Irish business around the globe I think Enterprise Ireland need to conduct some serious compatibility and usability tests on their website. At present it is not entirely clear that all their customers can quickly and efficiently find the vital information they want. It’s quite obvious now that this site will only render in IE (and I doubt it will render correctly in IE7). I just looked at the source code: 150 errors and 3 warnings. [UPDATE 4] Just noticed that I wasn’t the first person to notice this – Joe Drumgoole blogged about this back in May! I went through a very similar thought process when I noticed the same problem a few weeks ago and went through the same process to try and get an email address but stopped short of how far you got. It is very surprising to see it, especially a problem that is so obvious when you open it in such a popular browser. So I presume you didn’t manage to report the problem to them directly? I have a feeling that if their site development is out-sourced they may need to rethink the contract. No I didn’t report it, I looked briefly for a webmaster email address, and didn’t catch the link you spotted at the bottom of the email form. When people who are using the web every day are failing to see the mailto links it makes you wonder how the average visitor is going to get on. Will wait for browsershots to do its thing and hopefully post a screenie from IE7 later today. Broken on ie7…safari 2.0 on mac…all versions of firefox. Looks like all it does work on are ie6 and lower. I’m curious to discover whether the development was internal or outsourced? Actually I really just hope that they fix it. 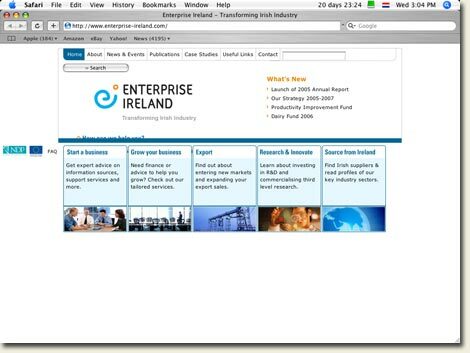 It portrays a poor image of Ireland at the moment – IT hub of Europe and we can’t even build a website. Is this the culprit? Seems like a reputable firm. Horrid URLs on their site though. 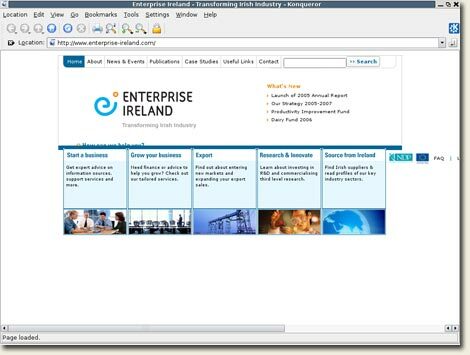 Well surprise, surprise they also provide the ‘Information Management System’ for none other than Funda.ie. I see they also do usability studies. Perhaps we should be careful blaming arekibo. As I said, they are a fairly reputable company. 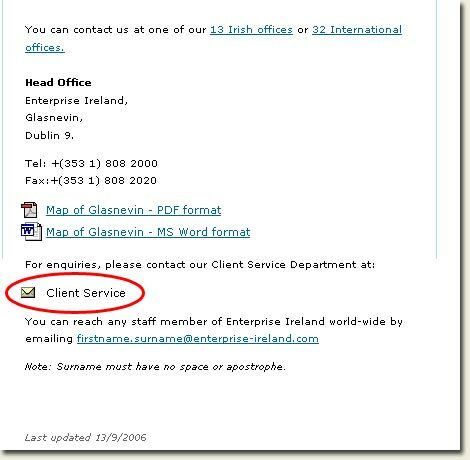 They say they handed templates over to the internal content management system in EI, perhaps something happened them there? If you pop back in I would love to know where you are sourcing your information. 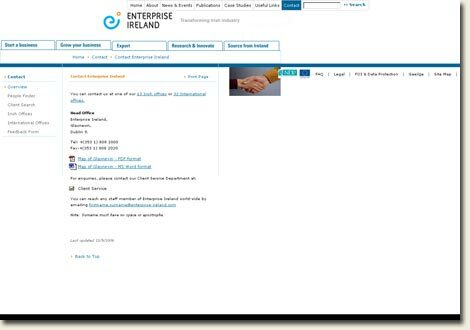 A google search for ” ‘enterprise ireland’ ‘web design’ ” (without the outer quotes) returned the page I linked to on the first page, and I got all the info there. Just read the page and I see that they state that they delivered the pages over to EI. Well as I received no response from EI to my email I gave them a call today. They took my details and fair enough I did later receive an email from Mary Cloak (On-line Marketing Manager) to let me know they are redesiging the website. This has been like this forever. I actually left the site many times because of this. Agreed. It’s a shame that companies that produce work like that actually get awarded the tenders in the first place. Hopefully, as the world becomes more educated on standards and accessibility, flagship websites like this will be a thing of the past. I have a feeling what you have here is a classic example of outsourcing the design/development and in-sourcing the maintenance. thanks for the reply. Yes, it was either outsourced somewhere where they didn’t care about the basics or the tender was awarded to some company that their sales skills far outweighted their actual development skills and ethics. Oh well, maybe one of our comapnies will get to do it….properly. As I mentioned earlier, it has been like this for a long time and I contacted them about 7 months ago about the issue. They don’t seem to see that this is a problem. It appears changes are afoot over at EI. I’m not quite sure why they have migrated these particular changes into production however – the pages still do not render 100% correctly. 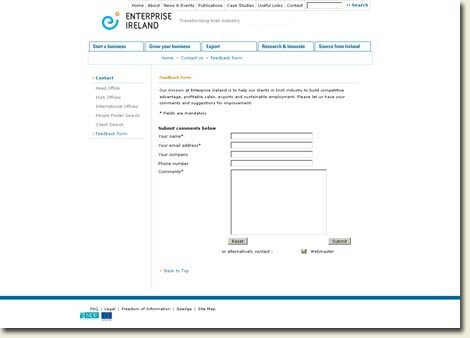 EI have fixed the site – see the update at the top of the post.